Cultures around the world have traditionally worshipped tall things, whether they be trees, mountains or monoliths. Of particular note is the worship of un-carved wooden pillars or poles, which seems to have had a peculiar connection to specific deities. Indra's Flagpole, aka Mahendradhwaja described in the previous chapter, and the chaityas described in the epics share the following characteristics with these international sacred pillars/poles. Most of these are found in the Levant and surrounding regions, stretching to Egypt in the south, Italy in the west, Turkey in the north, and Iraq in the east. Stele showing an Asherah Pole, sacred to semitic Goddess. As you can see, these examples cover many different civilizations, including the Egyptian, Phoenician/Punic, Assyrian, Canaanite (Semitic), Mycenaean, and Roman. However, these particular examples are of unique importance because they are unrelated to the Proto-Indo-European religion, as currently hypothesised. Oddly enough, the only other descendants of the PIE religion known to have similar pillars/poles are both of Germanic origin, and the pillar/pole motifs are from the Middle Ages (441 CE onwards). Saxon religion was extant primarily in the regions currently governed by Germany, France, Switzerland, Luxembourg, Belgium, Denmark and Britain. Although related to the religion of their northern cousins, the Scandinavians, they had some distinct practices and motifs, which include the one known as Irminsul. The name Irminsul means "great/mighty/rising pillar" in the Old Saxon language, and its oldest extant description calls it a defoliated tree trunk. It fits all the characteristics listed above, but the deity associated with it is not known. Unfortunately, all of the descriptions of this pillar/pole are second-hand, and written by people who destroyed or sought to destroy such pillars. In fact, the only pictorial representation of the Irminsul comes from a Christian sculpture in Externsteine, Germany, in which the Irminsul is being bent/broken by the Christian Cross. 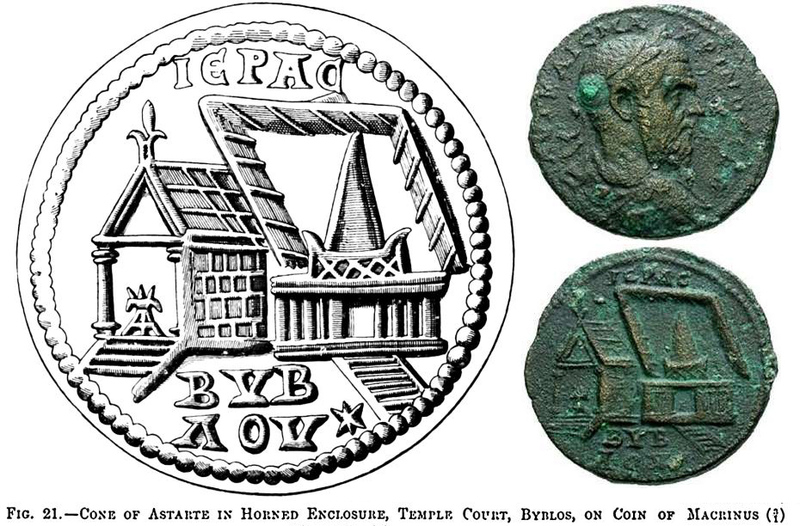 The bent/broken T-shaped structure on the right is alleged to be a representation of the Irminsul. The column above it is the foot of the Christian Cross. The relief was carved into the natural rock formations in Externsteine, Germany around the ninth-twelfth century CE. The Viking religion equivalent was the practice of venerating both actual trees and wooden pillars. Different deities had different trees dedicated to them, and typically all prayers, sacrifices and important social ceremonies would be undertaken under these trees. Of particular note is the oak tree, dedicated to Thor. In the Völsunga saga, an oak tree called Barnstokkr grows inside King Völsung's hall, into which Odin thrusts a sword, thereby kicking off the plot of the saga. Life of Saint Boniface, a biography written in 8th century CE speaks of a tree known simply as Donar's Oak (Donar is German for Thor), which was dramatically cut down by the eponymous Saint, in order to convert all the locals to Christianity. Further, in Iceland, a pair of wooden pillars known as Öndvegissúlur were to be found, which were dedicated to some deity and were used as symbols of royal authority. These were also immortalised in saga literature. Some tenuous connection may also be made to an artefact called Sampo from Finnish Mythology (which is a non-Germanic descendant of PIE religion). Sampo has been identified by some scholars as a representation of the pillar/world tree which holds up the sky-dome (a similar pillar is spoken of in the Rig Veda). Three things are immediately noticeable about this ancient trend of worshipping royal wooden poles/pillars. First, the timeline. The non-PIE poles/pillars are more or less contemporaneous with the accounts of Mahendradhwaja and chaityas in the Indic epics. Saxon religion may have existed as far back as 2nd century BCE, and Norse religion may also have been Pre-Roman in origin. Finnish religion, insomuch as it is relevant, may also have been Pre-Roman. Second, the obvious connections of these pillars/poles with both lightning and royal authority. It is common knowledge that tall trees/poles attract lightning. Therefore it would have been obvious for ancient people to imagine that the denizens of heaven would send lightning down to the poles and thereby exercise their authority on the mortal world. Thus, the most powerful deity(ies) of each of these cultures was associated with a pillar/pole. Because the concept of royal authority was closely related to divine authority in all of these cultures, it is not surprising that these pillars also became symbols of royal authority. Third, the unique case of the pillar in the temple of Aphrodite/Adonis in Byblos. Byblos is one of the oldest continuously inhabited cities in the world, and it was founded by the Phoenicians. The temple was also of Phoenician origin, and originally dedicated to the Goddess Astarte. By the time the city came under Roman control, it became associated with Aphrodite, who was of mixed ancestry - i.e. with Phoenician, Semitic and Indo-European attributes. Not only that, but this pillar was still being worshipped when the Mahendradhwaja and others had declined, and the northern counterparts were just being established. i.e. pillars such as the one in Byblos may represent the turning point in the migration of the concept towards northern Europe. Thus ends the chapter describing the origin and instances of the pillars of the Western counterparts of Shatakrata Aditya, aka Indra, using pillars, poles and posts as a device. Excellent essays Ishita, and the images you collected are lovely! As you said, the Viking deities had specific trees associated with them. Do we have that in the Hindu deities as well? I know that Vishnu is associated with the Peepal or Ashwattha tree. Something to look into.